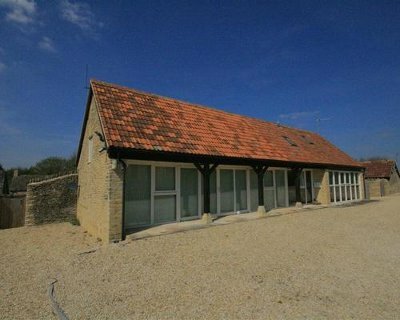 A lovely holiday cottage, "Albion Barn" has been converted from an old barn. This large holiday cottage sleeps 12 people, and makes a great holiday cottage to spend some time with friends and family. Located on the edge of the village of Upper Brize, near Burford in Oxfordshire, Albion Barn has plenty of places in the area to visit - and the nearest pub is a short walk away! Just because Albion Barn is an old barn, don't think you'll be sleeping on a bale of straw of some such; this holiday cottage has been designed to the highest specifications. Hopefully some of the pictures here will give you an idea of how nice Albion Barn is. The kitchen is fitted with top of the range equipment, and has three ovens - should you decide to cook a meal for everybody. The living room / dining room has plenty of sofas to relax into; and the dining has a table and chairs for all 12 of you. Albion Barn sleeps 12 people in 6 bedrooms: 4 double bedrooms and 2 twin bedrooms. One of these bedrooms is in a separate annexe to Albion Barn - this could be very handy for those holidaying with people who like a little extra privacy. Albion Barn has a TV, DVD player, Wi-Fi, washing machine, tumble dryer and a dish washer. Bed linen and towels are also supplied. Outside you'll find a lawned garden with patio furniture; and a hot tub - a hot tun can really make a holiday extra special; what better way of spending an evening after a day exploring the area? Should you want to get the sights around Albion Barn, you'll find Oxford, Stratford upon Avon and Bath all a drive from Albion Barn. You can also visit the Cotswold Wildlife Park, Blenheim Palace and Warwick Castle. The National Trust properties of Buscot Park ("Late 18th-century house, set in enchanting landscaped grounds"), Buscot Old Parsonage ("Early 18th-century riverside house with small garden") and White Horse Hill ("Ancient rolling downland, home to an enigmatic chalk hill figure") are all well worth a visit. Should Albion Barn not be to your liking, but you fancy staying in the area around Burford, you might well be interested in the cottages below. All these cottages are within a few miles of Albion Barn.